Angelies was the prize winner of the 2001 National Piano & Violin Competition (Piano Open category) in Singapore. During the same year, she also obtained her LRSM in Performing, learning under Prof. Pan Yi Ming. Born in Medan, Indonesia, Angelies had her early musical training at the age of 5. She joined Sumatra Conservatoire (formerly Lembaga Musik Murni) and studied under Leo Sri Suliani where she received many distinctions and awards including first prize of the Province Piano Competition when she was only 9, including The Young Talent Award, and High Scorer Award. Apart from piano, she also plays violin, saxophone and euphonium. Angelies furthered her studies in Singapore at the Nanyang Academy of Fine Arts (NAFA) where she studied under Alice Yap, and received numerous awards including Merit Award, Commendation Award, Best Performing Award and High Scorer of ABRSM Advance Certificate. 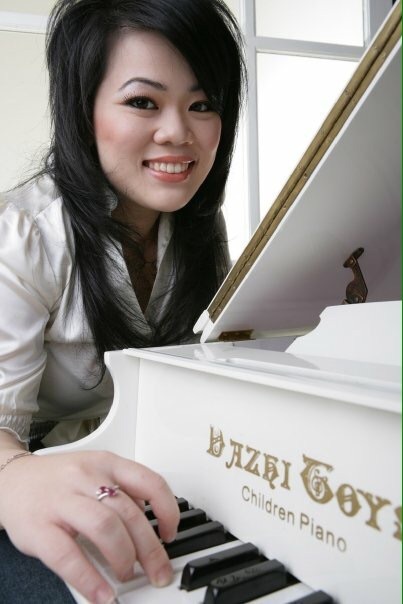 During her studies, Angelies performed regularly as soloist and accompanist at occasions such as the NAFA Annual Open House concert and the NAFA Arts Festival. She also premiered Goh Toh Chai's work "Ripples" at Esplanade in 2004, and several works by local composer Bernard Lee as well. She was also invited to perform at several venues in Malaysia and Indonesia, during the Singapore Arts Festival, Beijing International Choir Festival, and at the Esplanade Concourse. Angelies is also a member of UNIFive, a piano quintet ensemble group with four other fellow musician friends. UNIFive has been invited by YAMAHA to perform at their annual grand piano fair. She also had masterclasses with Claude Frank, Julia-I, Dr.Carol Ross, Richard McMahon, Mark Ray, Dennis Lee, Toh Chee Hung, Patsy Toh, Barry Snyder, Adam Gyorgy. Angelies was awarded a NAFA scholarship and received her BA(hons) in Music there, studying under Rena Phua.